When car speakers fail, they are often said to have blown out. This is usually characterized by a sudden and drastic reduction in sound quality, and it's usually caused by some type of mechanical or thermal failure in the speaker that prevents it from working like it’s supposed to. Mechanical speaker failures typically happen when the cone in a speaker is forced to move further than it was designed to do, and thermal failures happen when a speaker is hit with too much power and delicate internal components either melt or burn. In most cases, car speakers blow out due to accidents or carelessness, like cranking up the volume too high and leaving it like that for too long. However, it is possible for car speakers to fail due to age, and speakers that were constructed to inferior materials to begin with are more likely to blow out during normal usage as they age. Why, and How, Do Car Speakers Blow Out? When someone says that a speaker is blown out, they basically just mean that the speaker has suffered some kind of catastrophic failure. The speaker may not work at all, or it may sound really bad. In a situation where a car speaker is totally blown, you usually won’t hear any sound at all from it. In other cases, you may hear a buzzing sound instead of the music that you’re trying to listen to. Since there are a lot of reasons that car speakers can stop working, it’s important to make sure your speakers are actually blown before replacing them, even if they make no noise at all. When a car speaker is just partially blown, you’ll usually still get sound from them, but the sound will be distorted. You may hear a hissing or crackling, static, or fuzzy distortion may seem especially prevalent in a specific sound range, depending on the type of speaker that has failed. Car speakers usually fail due to mechanical and thermal problems, but basically anything that damages a speaker to the point where it no longer works correctly will essentially blow it out. Since most failures are either mechanical or thermal in nature, the best way to avoid blowing out your speakers is to refrain from operating your car sound system at excessive volumes. Distorted sound, hissing, and fuzziness. If you suspect blown speakers, set your volume at a low- to mid-level, and listen for distortion. Listen to a CD, or plug in an MP3 player, to avoid normal static that's associated with FM radio. If you hear any hissing or fuzziness, and turning up the volume causes the distortion to get worse, use the fade and balance to isolate the problem speaker. In most cases, you'll find that one or more of your speakers has loose or damaged voice coils. Telltale popping or rattling instead of music. If you don't hear your music at all, and instead hear unpleasant sounds like popping or rattling, that's a major red flag. Your speakers are almost certainly blown. Lack of bass, treble, or mid-tones. A sudden and drastic reduction in bass response is usually a good hint that your speakers have partially blown out. Try using the equalizer controls on your car radio, and if you notice a complete lack of bass, treble, or mid-tones, you probably need new speakers. Lack of vibration from the speakers. This is sometimes a sign of completely blown speakers, but it can also be caused by a wiring problem. Feel the front of your speaker grills when the system is in operation. If you don't feel any vibration at all, you'll need to check and see if your speaker wire connections are broken. If you have a multimeter, and you're able to remove your speaker grills, you can check the impedance of each speaker. Speakers that are in good working order typically had an impedance of 4 or 8 ohms. If you find that your speakers have extremely high, or even infinite, impedance, they're blown. What Causes Car Speakers to Blow Out? Mechanical car speaker failures happen when a component called a cone is forced to move in a way that it wasn’t designed to. What happens is that the cone moves further than it is supposed to, which stresses the material. This can cause parts of a speaker to collide with each other or the speaker frame, which can cause components to tear, break, or come loose, which can cause permanent damage. Thermal car speaker failures happen when a speaker receives more power than it can deal with. The excess power causes a buildup of heat, which can soften the glue that holds some components together. This essentially blows the speaker, since it will no longer produce sound like it used to. The other danger with feeding too much power to a car speaker is that the excess power can literally burn or melt the delicate wires inside a component called a voice coil. This is one of the most catastrophic failures a blown speaker can suffer, since you usually won’t get any sound at all out of a speaker with a voice coil damaged in this manner. In both mechanical and thermal failures, the most common causes are accidental or carelessly operating a system outside safety margins. For instance, turning up the volume of a car stereo system so high that you start to hear a gritty tone means that the voice coils in your woofers may have separated from the spiders that hold them in place, and leaving the volume like that may do permanent damage. Although simply turning up the volume too high, and leaving it there for prolonged periods of time, is the most common cause of blown speakers, there are also a lot of more technical causes. If a sound system is improperly designed, that can also make it more likely that the speakers will end up blown at some point. Amplifier clipping, physical damage to a speaker, and a number of other causes can also cause a blowout. Clipping is an issue that is sometimes seen in car audio systems that include a dedicated amplifier. This problem arises when the amp is overdriven and the tops and bottoms of the audio waveform are literally clipped off. If clipping occurs, it’s actually possible to damage speakers that are designed to handle more power than the amp is even rated to put out, since the clipped waveform results in too much power being delivered to the speaker over time. Physical damage usually occurs when a speaker is carelessly installed, or when the protective grills comes loose and isn’t immediately replaced. 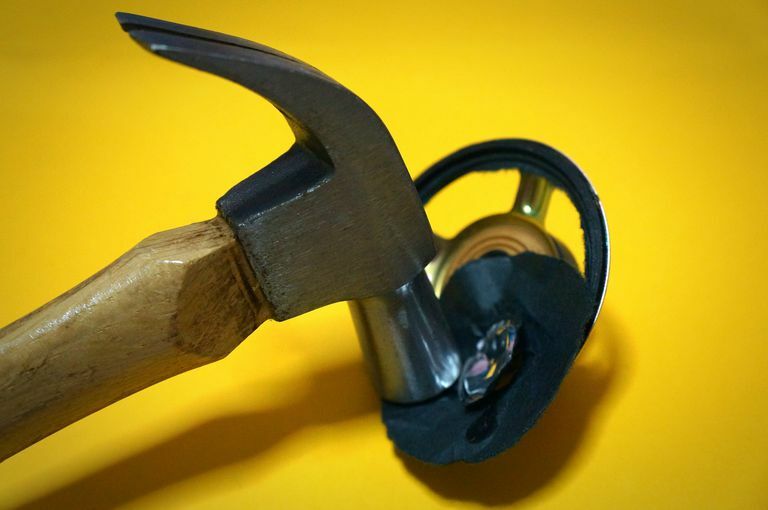 Without a protective cover of any kind, it is very easy to damage a speaker by piercing or tearing the cone since they are relatively delicate. If any of your car speakers are missing their covers, and the speakers aren’t yet damaged, it’s a pretty good idea to get them covered up right away. It’s also totally possible for car speakers to simply fail due to age and normal use. This is especially true with OEM speakers that are typically made from inferior materials in comparisoncar to higher end aftermarket speakers. How Do You Tell if Your Car Speakers Are Blown? Sometimes it’s easy to tell that your speakers are blown, and sometimes it’s a lot harder, and a lot of that depends on exactly how they blew. For instance, if your blown speakers failed due to the voice coils burning, that’s pretty easy to diagnose. If you aren’t getting any sound at all from a speaker that you suspect has blown, one way to tell for sure is to check for continuity. You do this by removing the speaker grille, door panel, or whatever other components you need to pull in order to access the speaker. Disconnect the speaker wires, and then check for continuity between the two speaker terminals. If your multimeter shows no continuity, that indicates the speaker is blown. In most other cases, the only way to tell whether a car speaker is blown is to listen and then rule out other possibilities. This can be hard if you don’t have a trained ear, so you’ll want to start with some full range music that you’re pretty familiar with. Anything that goes hard on bass, or treble, and leaves out one end of the spectrum or another, may make it harder to figure out what’s going on. With familiar music playing at a reasonable volume, you’ll want to check your equalizer controls if you have them. They should all be set at neutral levels for this type of diagnostic, even if that isn’t how you normally like to listen to your music. For instance, if your head unit has bass and treble knobs, they should typically be rotated to 12 o'clock. The reason that you’ll want to use music you’re familiar with, and use default equalizer settings, is that a big part of listening for a blown speaker is recognizing whether or not your speakers are suffering from a lack of range. This can be hard if your ears aren’t really trained to identify missing registers, and it’s easier if you know a song inside or out. If you feel like something is “missing,” then it might be a blown out speaker. In addition to listening for a lack of range, you can also listen for distortion, static, rattling, and other noises. While distortion isn’t a sure sign of a blown speaker, it does usually indicate that something is wrong somewhere along the line. Once you feel like you’ve heard something out of the ordinary, you may be able to isolate the blown out speaker by playing around with the balance and fade settings on your head unit. By adjusting the balance and fade to focus specifically on the speaker or speakers in each of the four corners of your car, you can usually narrow things down a lot. While it is certainly possible to repair a blown car speaker, it usually isn’t worth it. Repairs are typically costly in comparison to just buying a new speaker although there are some exceptions, especially if you are comfortable doing the repairs yourself. For instance, it’s often possible to fix a dented speaker cone if you’re careful, and small tears can even be repaired with a little work. The sound quality may not be what you used to get out of the speaker, but this type of DIY repair is cheaper than replacing the blown unit. Blown voice coils are more difficult and expensive to deal with, especially if you opt to pay someone to perform the repairs. If you’re comfortable doing it yourself, you can actually get ahold of recone kits for some speakers that include a new cone, voice coil, spider, dust cap and gasket. If you opt to replace your blown equipment, it’s important to choose the right new car speakers and also look at what may have blown them in the first place. For instance, if your car has an aftermarket sound system, you may want to make sure that the head unit, amp, and speakers are all playing nice together. If you have a stock sound system, then you should be safe upgrading the blown speakers with direct-fit aftermarket replacements. The new speakers should work just fine if you keep the volume low enough to avoid distortion.